Formerly 515 South Spring Street, this house is not within the bounds of East Wilson Historic District. However, South Spring Street, now Douglas — below the warehouse district — has been an African-American residential area since the turn of the twentieth century. The house likely originally comprised only two rooms — known as the “saddlebag” type. An ell at the rear would have been added later to encompass a kitchen and bathroom. Current tax records show that the house measures 792 square feet. For some thrifty colored person. Wilson Daily Times, 28 October 1944. The one hundred-fourth in a series of posts highlighting buildings in East Wilson Historic District, a national historic district located in Wilson, North Carolina. As originally approved, the district encompasses 858 contributing buildings and two contributing structures in a historically African-American section of Wilson. (A significant number have since been lost.) The district was developed between about 1890 to 1940 and includes notable examples of Queen Anne, Bungalow/American Craftsman, and Shotgun-style architecture. It was listed on the National Register of Historic Places in 1988. The vacant lot at 206 North Pender Street. Visible in the distance is the corner of Ashe Street and Darden Lane. In 1940, Donnie Daniel Graham registered for the World War II draft in Chowan County, North Carolina. Per his registration card, he was born 15 February 1908 in Wayne County; he resided at 211 East Church, Edenton, Chowan County; his contact was Nancy Crocker, 206 Pender, Wilson; and he worked for George P. Folk, Hotel Joseph Hughes, Edenton. James H. Crocker died 3 May 1945 in Wilson. Per his death certificate, he was 65 years old; was born in Wayne County to Joseph I. Crocker and Celia Hooks; was married to Nancy Dew Crocker; resided at 206 Pender Street; and worked as a common laborer. Informant was Gaston Crocker, Fremont, North Carolina. Photo courtesy Google Maps Streetview. The one hundred-third in a series of posts highlighting buildings in East Wilson Historic District, a national historic district located in Wilson, North Carolina. As originally approved, the district encompasses 858 contributing buildings and two contributing structures in a historically African-American section of Wilson. (A significant number have since been lost.) The district was developed between about 1890 to 1940 and includes notable examples of Queen Anne, Bungalow/American Craftsman, and Shotgun-style architecture. It was listed on the National Register of Historic Places in 1988. Robert C. Bainbridge and Kate Ohno’s Wilson, North Carolina: Historic Buildings Survey (1980) provides additional details about the house, including the photo above: “This L-plan cottage probably dates c. 1880. It boasts a handsome three-sided baby in the front ell. The bay is ornamented by a molded cornice, paired scrolled brackets, and arched window surrounds.” As shown in Sanborn fire insurance maps, prior to 1923 the house was numbered 130 Pender. 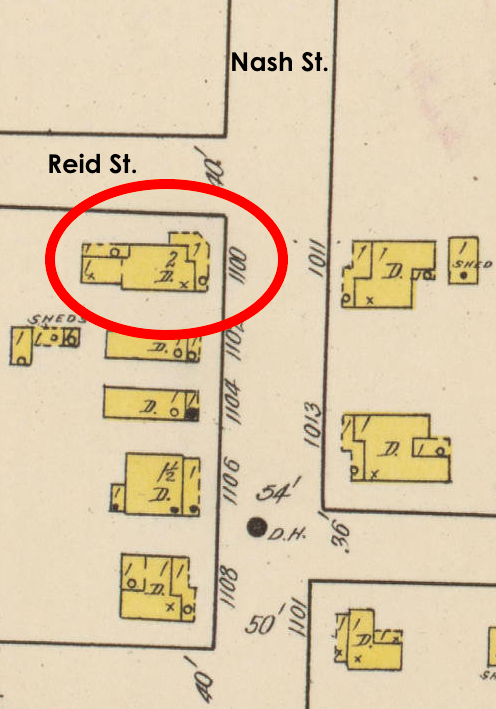 From the 1908 Sanborn fire insurance map of Wilson. In the 1920 census of Wilson, Wilson County: at 130 Pender, minister of the Gospel Henry W. Farrior, 56; wife Icey, 54; and granddaughter Florence, 10; plus Isadora Estoll, 18. In the 1930 census of Wilson, Wilson County: at 203 Pender, owned and valued at $4000, Christian Church minister Henry W. Farrior, 60, and wife Aria, 60, with boarders tobacco factory stemmer Earnest Bulluck, 35, his wife Lena, 30, and children Earnest Jr., 12, Paul T., 8, and Lee, 7. In the 1940 census of Wilson, Wilson County: at 203 Pender Street, widow Ossie M. Royall, 33, an elevator girl at the courthouse; her mother Tossie Jenkins, 53, stemmer at a tobacco factory; daughters LaForest, 16, and Evaline Royall, 14; and a roomer named Ed Hart, 45, a laborer employed by the town of Wilson. 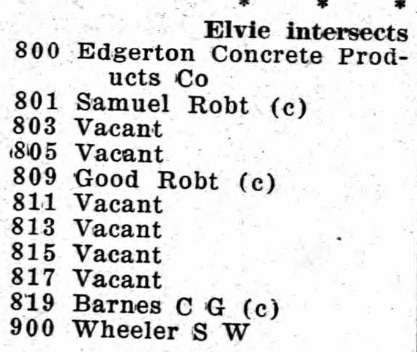 Ossie and LaForest were born in Wilson; Evaline in Battleboro [Nash County]; and Tossie and Ed in Nash County. 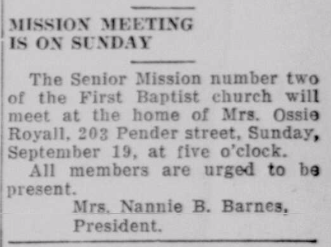 Wilson Daily Times, 18 September 1948. 203 North Pender has been demolished. The property now belongs to nearby Calvary Presbyterian Church. Though not in the Historic District, this tight cluster of shotgun houses in the 1100 block of South Railroad Street — called “endway” locally — comprises a sight once common across East Wilson. Built cheaply from about 1900 to World War II as rental housing for low-wage workers, relatively few of the District’s endway houses have survived into the twenty-first century. 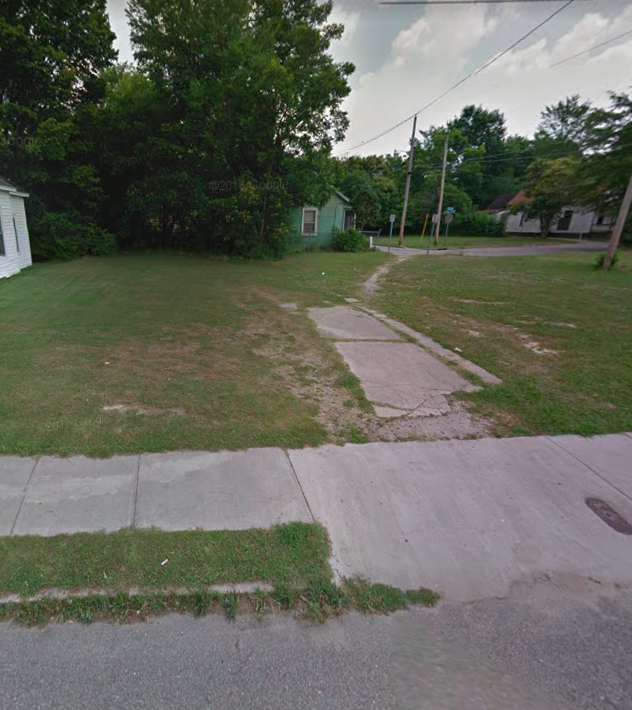 Google Maps Streetview shows the 1100 block from the corner of Railroad and Lincoln Streets. Top photo by Lisa Y. Henderson, February 2019. 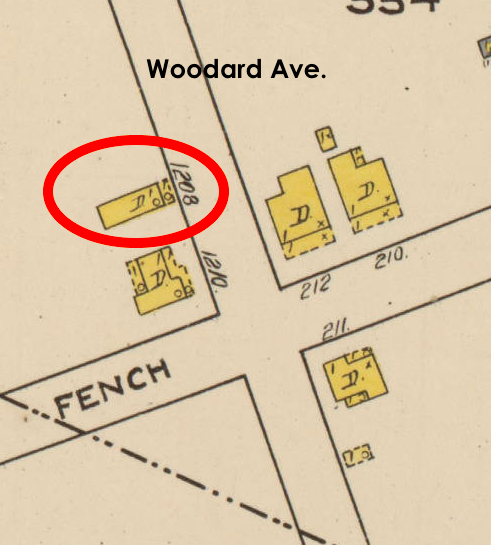 The house at 123 North Pender Street was located just outside East Wilson Historic District and within the bounds of Wilson Central Business District-Tobacco Warehouse Historic District. 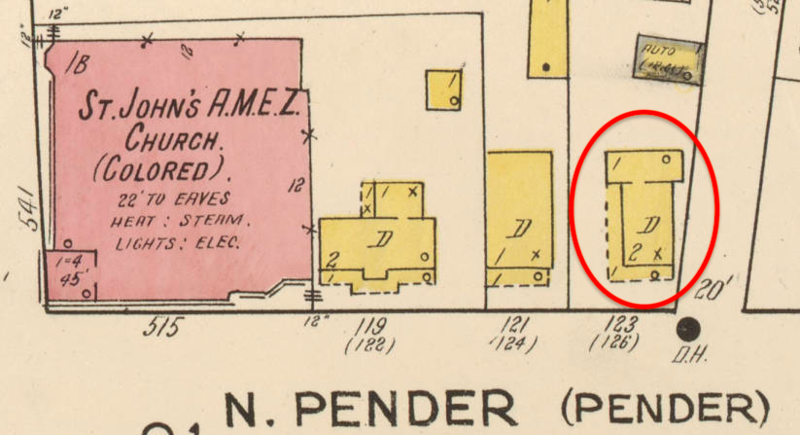 As shown on this detail from the 1922 Sanborn fire insurance map of Wilson, this lot was originally numbered 126 Pender. 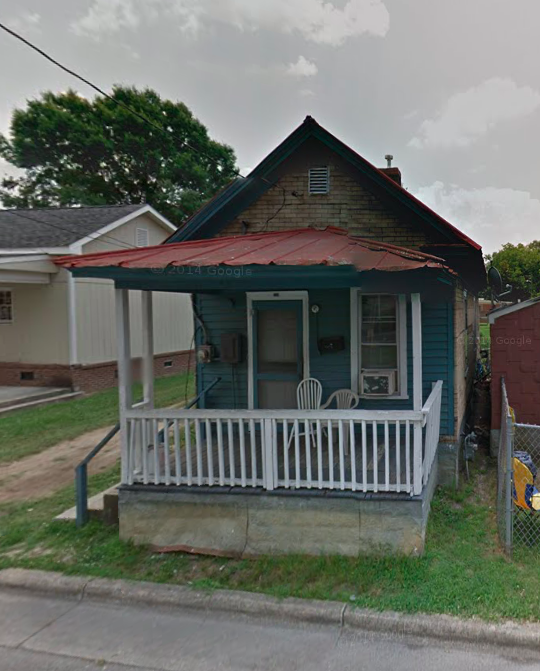 In the 1920 census of Wilson, Wilson County: at 126 Pender Street, Virginia-born house contractor Mansfield H. Wilson, 60; son Samuel H., 20; and sister-in-law Lucy Richards, 40. 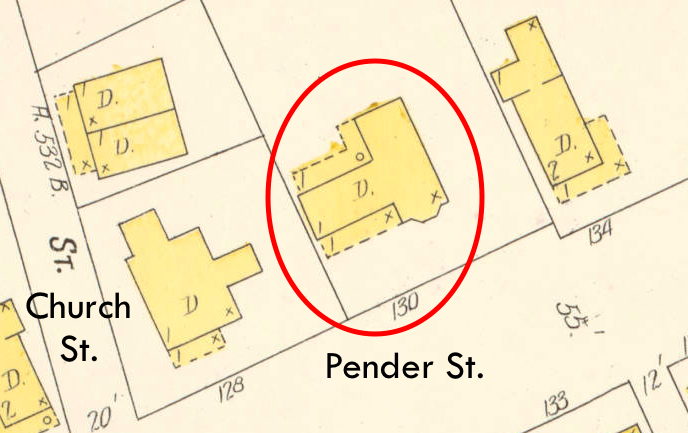 In the 1930 census of Wilson, Wilson County: at 123 Pender Street, owned and valued at $2000, Virginia-born carpenter Mansfield Wilson, 50, widower; son Samual, 30, insurance company agent; daughter-in-law Sarah, 24, public school teacher; granddaughter Audrey, 3; and sister-in-law Lucey Richard, 50. 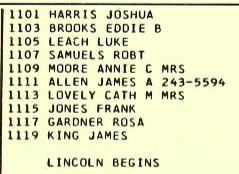 In the 1940 census of Wilson, Wilson County: at 123 Pender, Sam Winsted, 36, laborer for Town of Wilson; wife Mattie, 34, cook for private family; children Mattie, 15, and Hilton, 12; brother James Parker, 55; and Louisa Mercer, 15, roomer. In 1942, Frank Junior Pope registered for the World War II draft in Wilson. 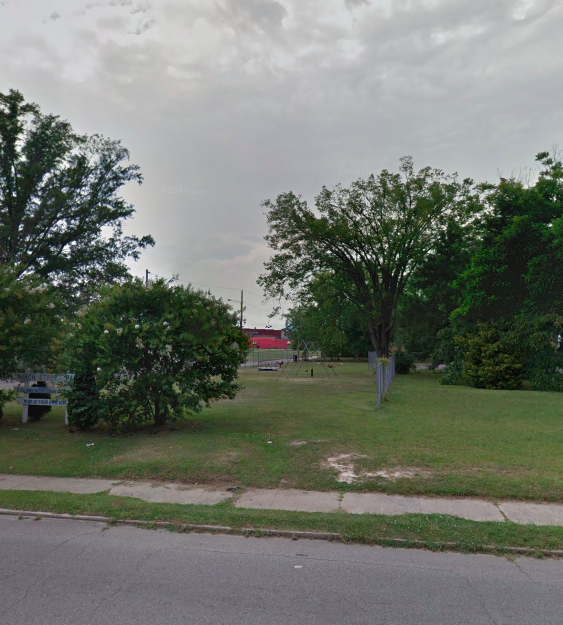 Per his registration card, he was born 1 June 1924; resided on Stantonsburg Street, Wilson; his contact was Mrs. Mattie Winstead, 123 Pender Street; and he worked for his father, Frank Pope, Stantonsburg Street. Photo, likely taken circa 1979, is courtesy of Robert C. Bainbridge and Kate Ohno’s Wilson, North Carolina: Historic Buildings Survey, originally published by the City of Wilson in 1980 and updated and republished in 2010 under the auspices of the Wilson County Genealogical Society. 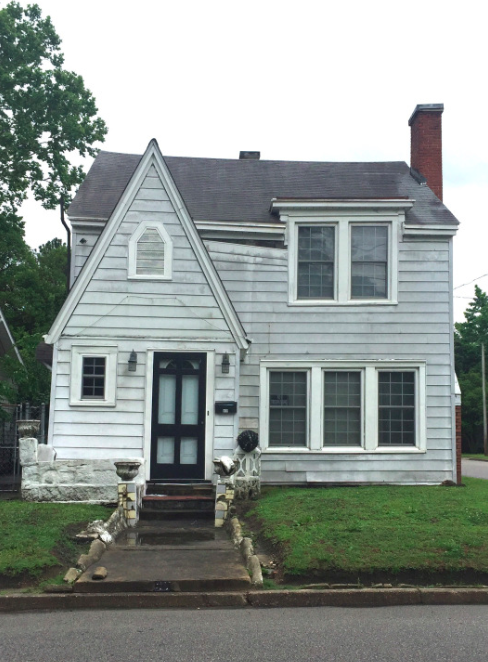 A Sears catalog house in East Wilson? Reader Mela Sims identified the house at 408 North Reid Street as a Sears Honor Bilt catalog home (or facsimile) — the Barrington Model — which explains the dwelling’s unique lines among others in the neighborhood. Thank you, Mela! Catalog page courtesy of antique-home.com. Photo by Lisa Y. Henderson, 2016.